It is something I have been trying to cultivate more lately…but it doesn’t always come easy. Sometimes it is there, sometimes not, but I find that if I make space in my life for creativity, something unique, whimsical, or even beautiful is bound to come out. 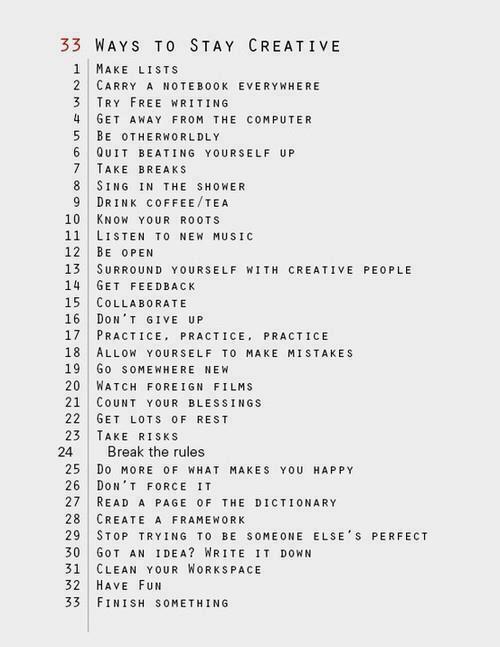 Here is a list of 33 Ways to Stay Creative that I wanted to share. Here’s to embracing your creative side, whatever you medium may be! Happy Monday. Make it a good one. Next Post Inspiring A*R*T: Mexico…again! Thanks Pratibha…I thought it was a pretty great list with some tips I had not thought of. I love this list! I’ve never tried reading a page of the dictionary with this intention. I can imagine now just how fruitful it would be. So many great ideas …. thank you! Glad you appreciated it Ruth! Yeah, I thought the dictionary one was kind of fun and random. Besides, your post inspired me and it made me start thinking about where we draw inspiration from….sometimes we just get stumped. Happy day and thanks for commenting!